The technology, seen as a potential move toward bionics, could one day enable wireless updates for corrective lens prescriptions, if it comes to fruition. Google has filed a patent application for an electronic device that could be implanted in the eye and potentially correct or even replace eyesight. 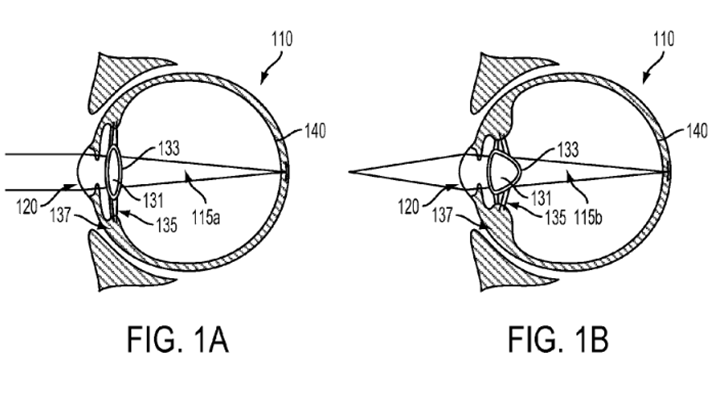 The patent, first filed with the U.S. Patent and Trademark Office in 2014 but published just this past week, is for an intraocular device with an electronic lens. "The device can be installed within a flexible polymeric material shaped to conform to the inside surface of a lens capsule of an eye," according to Google. It could be controlled in a such a way where the "device and polymeric material can restore a degree of accommodation to the eye." This isn't the first time Google has set its sights on highly sensitive devices for the eye. For the past several years it has been working on a prototype contact lens that could monitor glucose levels. But this technology would be a big leap beyond, toward full-on bionics. Suffice it to say, any real-world applications of this technology are probably some distance in the future, if they happen at all. But the potential is exciting (if also perhaps a bit disconcerting). "Such a cyborg eye implant could change its shape and adjust the wearer’s vision by using technologies such as liquid crystals, micro mirrors and tiny micro-fluidic pumps. It may also include additional lenses to help fix eyesight problems such as myopia (nearsightedness) or astigmatism,” according to the Discover blog. "The implant could wirelessly send data to a smartphone, tablet or laptop that has an Internet connection." The device could then pass on the data to an optometrist’s practice, where clinicians could perhaps "send signals with commands to change the programming that controls the electronic lens vision," Discover's Jeremy Hsu wrote. "That might represent the equivalent of a wireless update for corrective lens prescriptions."